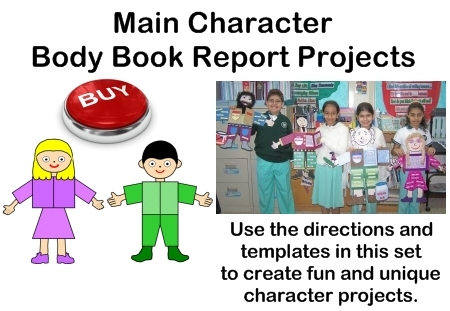 Character Body Book Report Project: templates, worksheets, rubric, and more. 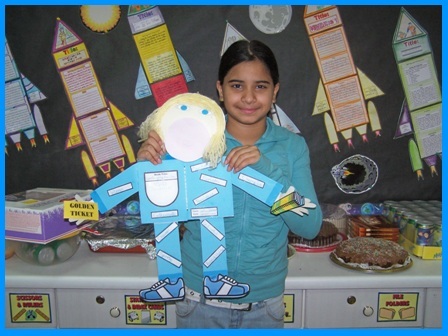 Your students will love designing large character body projects about the characters found in their books. 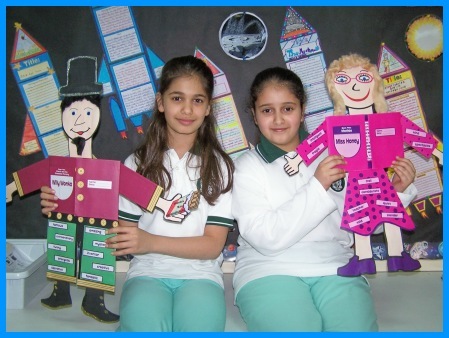 This project is also ideal for a biography book report about a famous person. You can read more detailed information about this resource by clicking ==> HERE. 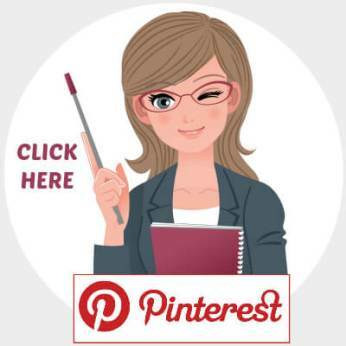 A Note About Your Purchase: You will be emailed a download link for the resource(s) that you purchase so that you can download, save, print, and use the resource(s) today! Save and reuse the resource forever. 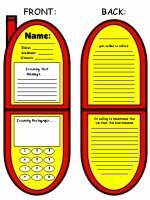 Print as many copies as you need for your students. A very DETAILED description about this resource set is provided below. 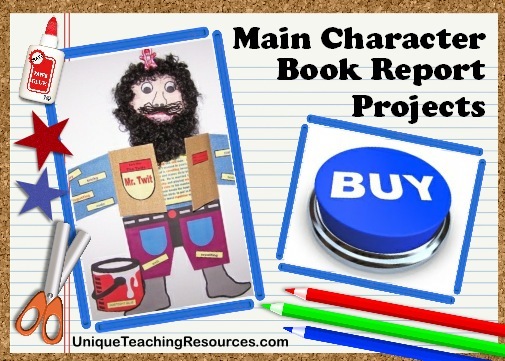 Main Character Body Book Report Projects: Your students will love creating large visual images of the main characters of their books for this creative book report project idea! 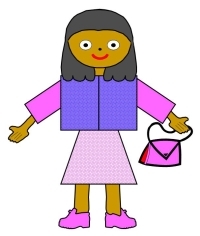 The writing templates and graphic organizers that I have designed fit inside on the character's shirt and outside on the character's vest, arms, pants, or skirt. 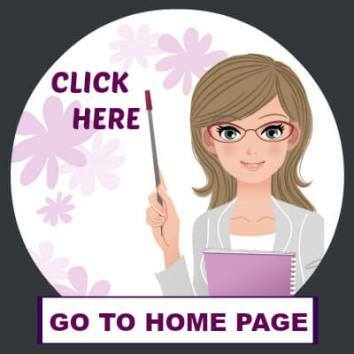 This main character book report project will provide you with all of the teaching resources that you need for your students to write about the main characters of their books. The only additional material required to complete this project is construction paper. Traditionally, requiring students to write about the main characters of their books is a task that most students find quite boring. 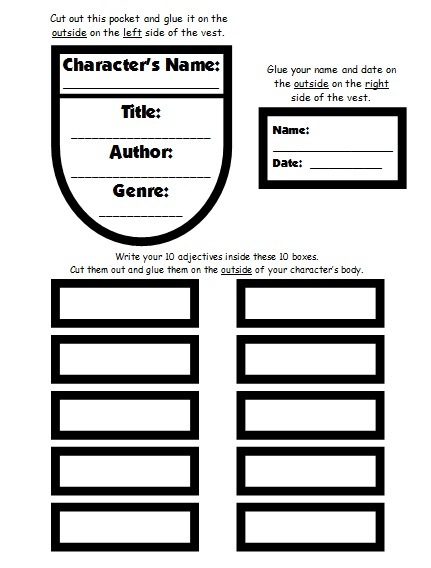 By using these body shaped book report templates, your students will be enthusiastic about writing how their characters have changed or learned an important lesson during the main events of their books. featuring my students' main character book report projects. 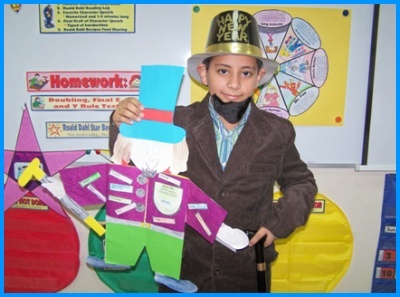 You will be amazed at some of the creative ideas that your students come up with as they are individualizing their projects to represent their character's appearance, personality, and interests. Charlie and the Chocolate Factory) and designed a character book report project about him. This student dressed up as Charlie Bucket from Charlie and the Chocolate Factory. 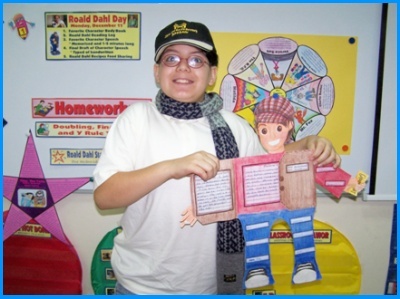 He is holding his project so that you can see how the character's vest opens to reveal the writing sections. This student has designed her Matilda (author Roald Dahl) book report project to have the same dress and fabric as the dress that she is wearing! 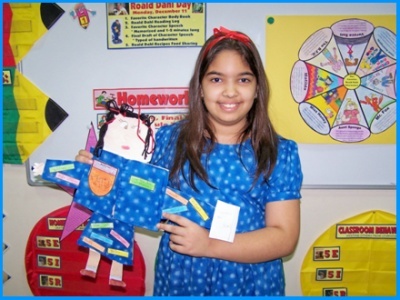 This main character project contains directions on how to fold a piece of construction paper into a body shape. 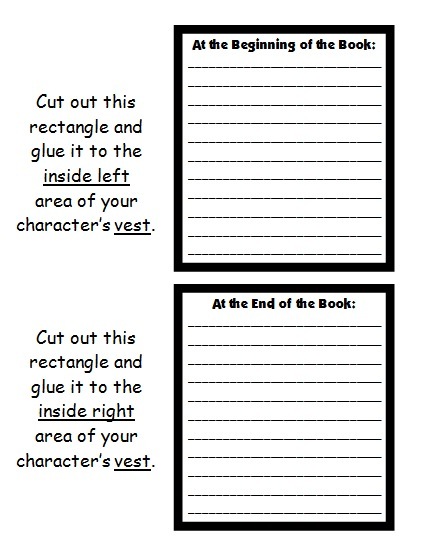 The character's body has a vest that opens up to show the shirt area, where students glue their longer writing sections (see the Charlie Bucket example above). 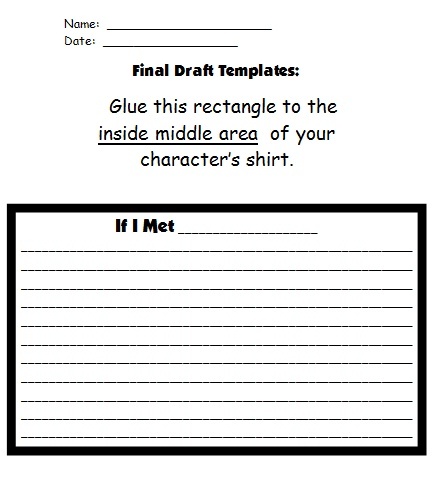 The final draft worksheet templates that are provided fit inside the shirt area, outside on the vest, and the 10 adjective descriptions are glued on the outside of the character's body. It is impossible to tell you the measurements of this book report project because each student designs their own head, hands, legs, and feet for their characters. Without the additional body parts, the main part of this project measures 18 inches in width and 12 inches in height. Students then add the head, hands, legs, and feet to this main body section. 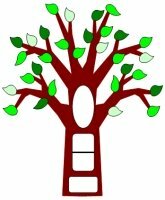 Everything that you need to complete these character body book report projects is included in this set of teaching resources. 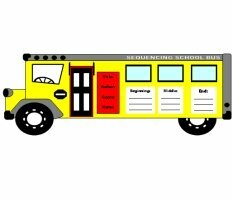 Your students will need scissors, glue, tape, coloring pencils, and construction paper to complete these projects. 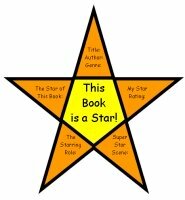 For the main body section of this book report project, each student will need a piece of construction paper that measures 12 inches x 18 inches. 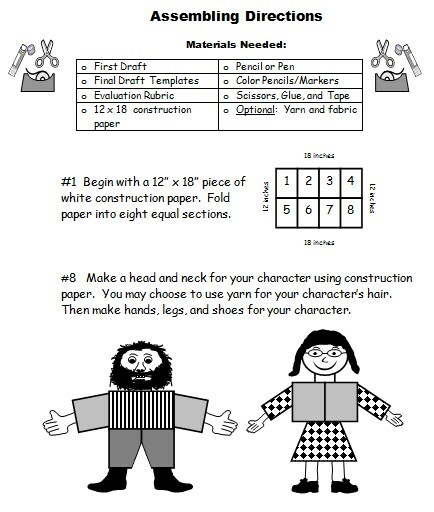 Students will also need construction paper to make the character's head, hands, and feet. In addition, my students often bring in yarn and fabric from home for their character's hair and clothes. This student dressed up as Violet Beauregarde from Charlie and the Chocolate Factory. 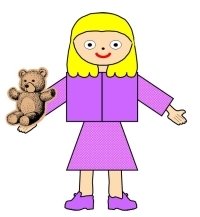 She's used a "pink/violet" color for her character's clothes AND her own clothes AND hair! 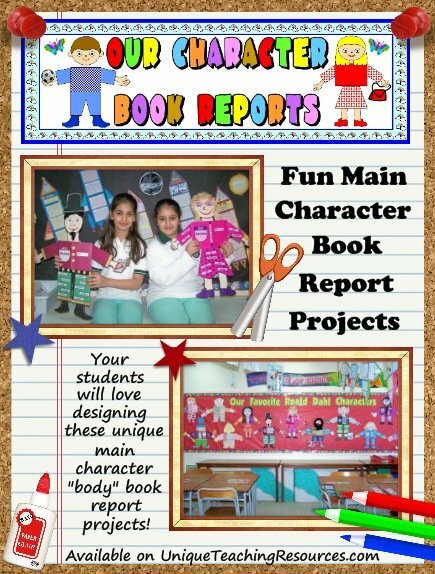 These finished character body book report projects will make a colorful and dynamic bulletin board display of your students' work. 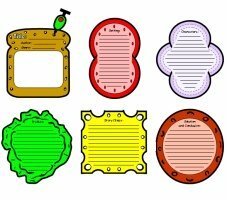 There are 10 printable worksheets and template pages in this set of teaching resources, as well as a 5 page color bulletin board display banner. 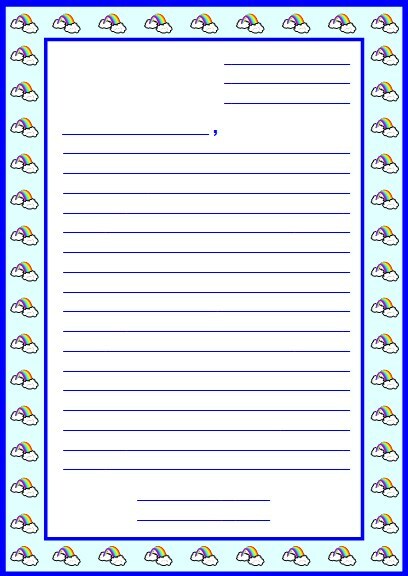 In addition, I have designed a set of letter writing stationery and a matching bulletin board display banner that is included for free in this set of reading resources. You can use this stationery set so that your students can write a letter to their main characters when they have finished their character body book report projects. 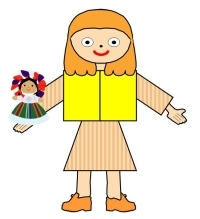 Note: Due to spelling differences in English (Examples: color/colour and favorite/favourite), there are two separate sets of worksheets and templates included in this set of teaching resources. You can select the version (U.S. or U.K. spelling rules) that contains the spelling that is used in the country where you live. 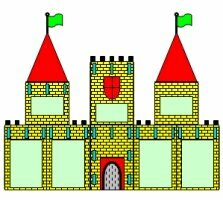 The worksheets and templates that are shown on this page use U.S. spelling rules. 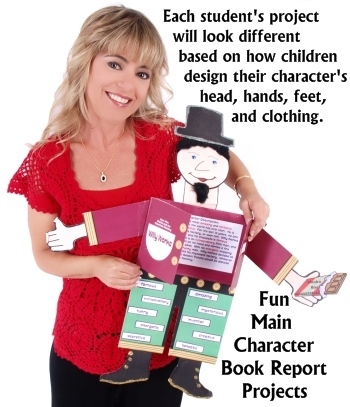 This set of teaching resources includes 3 pages of detailed assembling directions on how to assemble this main character body book report project. 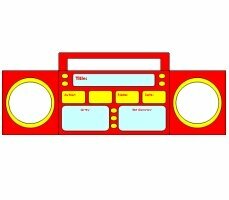 Below is a sample of the assembling directions worksheets. I have only shown the first step and the last step of the directions in the sample below. The actual directions worksheets (not shown) are split up into 8 steps and there are graphical images provided for each step. 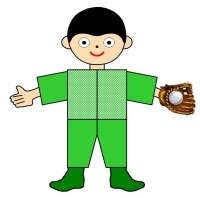 The picture examples on the actual assembling directions worksheets demonstrate exactly how, in 8 steps, to cut and fold the construction paper to form a character body that has a vest that opens. These directions also show how to design a male character that is wearing pants or a female character that is wearing a skirt. A book report grading rubric is included in this set of teaching resources. I believe that it is important for students to evaluate their own work, so my book report rubric contains an assessment section for both students and teachers. When students evaluate their book report projects, they color in the faces on their grading rubric worksheets. When a teacher evaluates the projects, the teacher circles the small numbers inside each box on the printable worksheets. 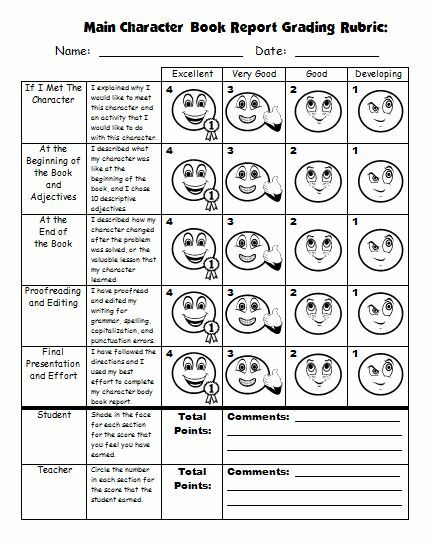 Below is an example of my character body book report grading rubric. I believe that the writing process is important and that teachers should use process writing whenever possible. For this reason, my students never begin their book report projects by writing on their final draft character body templates, instead they write on first draft worksheets. Next, my students edit and revise their written work on their own, with a partner, or in individual writing conferences with me. 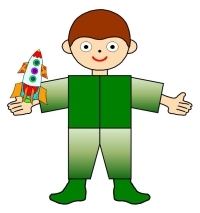 This main character body book report project is designed so that each writing section is glued onto the shirt and vest area of the character's body. 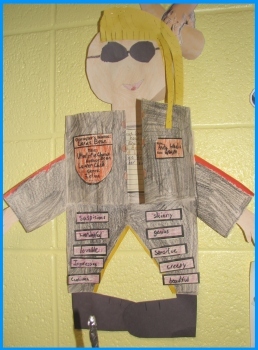 Adjectives: Students write 10 descriptive adjectives about their character and glue them on the outside of the character's body. 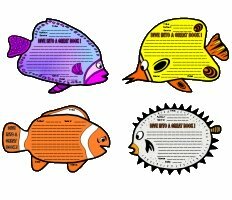 This set of teaching resources contains 3 printable worksheets for students to write their first drafts on. 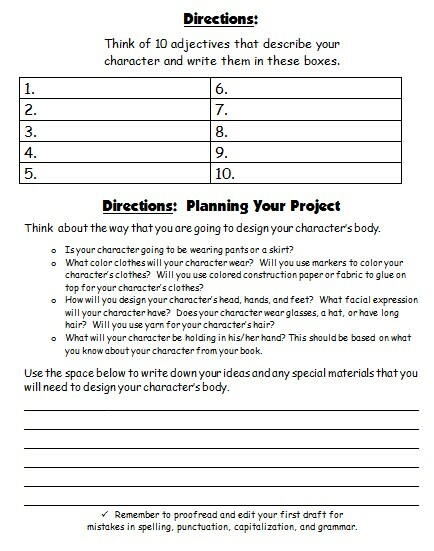 On my first draft worksheets, I have designed the writing line spaces to match the spaces allotted on the final draft character body book report templates. This book report project contains 3 worksheets that contain writing templates that are cut out and then glued onto the main character's body. Describe why you would like to meet this character from your book. What activity would you like to do with this character if you met him or her? Try to think of something that this character would be interested in doing based on what you learned about him/her from the book. Describe what your character was like at the beginning of the book. What problem, or challenge, did this character have to solve? Describe what your character was like at the end of the book. How did this character change after he/she solved his/her problem or challenge? What valuable lesson did your character learn at the end of the book? 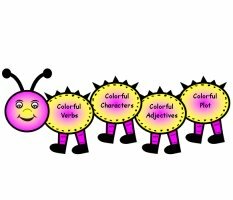 Adjective Boxes: Students write 10 descriptive adjectives about their character and glue them on the outside of the character's body. I know that it takes teachers a lot of time to design and assemble their classroom bulletin board displays. Many teachers spend their valuable time cutting out large display letters or making a banner at home on their own computers. 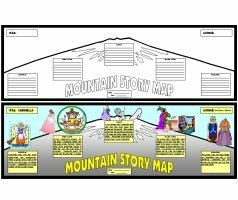 In order to help save you time in assembling a bulletin board display featuring your students' character body book report projects, I have designed a 5 page banner that is included for free in this set of teaching resources. If you have access to a laminating machine, I recommend that you laminate your banner so that it will be more durable and you can use it again in the future. 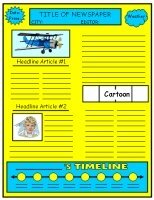 EXTRA FREE TEACHING RESOURCES: For each of the book report sets that are available on Unique Teaching Resources, I try to design some extra bulletin board accent pieces that will help you to decorate your classroom bulletin board display that features your students' book report projects. In addition to the main project that is described above, I have my students write a letter to the main characters in their books. 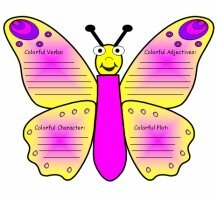 I have designed a matching set of rainbow letter stationery and a bulletin board banner for this creative writing activity. 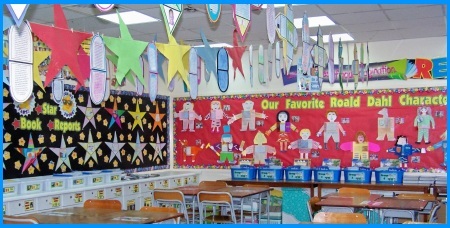 You will be able to design a colorful and dynamic classroom bulletin board display using your students' finished character body book report projects. 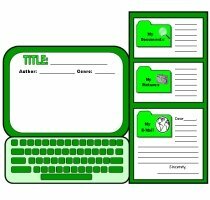 These main character graphic organizers are a unique and fun way to get your students excited about completing a writing assignment about the books that they have read. 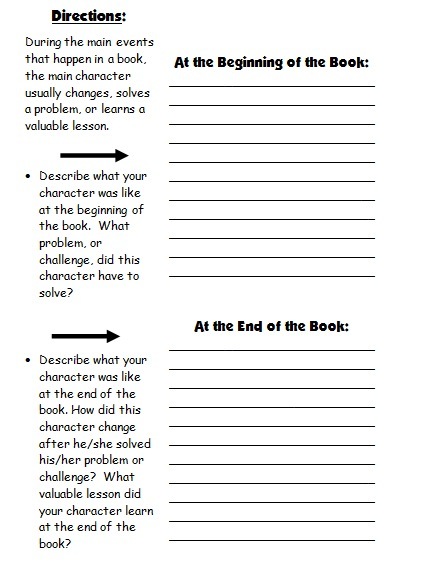 The writing responses that are required of your students will make them think and write about how the main character in their story has changed or learned a valuable lesson during the events of the book. In addition, this book report project includes a letter writing activity and a matching bulletin board display banner. This is one of the first book report projects that I assigned my students. I have gone through many versions of this project while I tested and refined the direction steps and template pieces. The first year that I tried this book report project with my students, I basically just gave out the directions for folding the poster paper into the shirt, vest, and arm shapes. 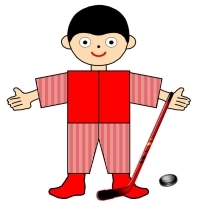 I had body book reports turned into me that were in a variety of shapes and sizes, from 6 inches in height, all the way up to 6 feet tall! 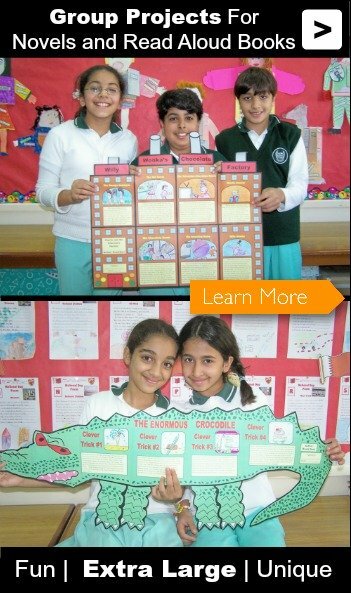 It was very hard to create a bulletin board display of these projects when they were such different sizes. Although each student still designs a very different looking character project, by following the detailed direction steps that I now provide, my students' projects have a similar shape and size to them. I have tested sending this whole project home (the directions, first draft, and final drafts) as a week long homework assignment, and my students were able to complete all of these steps on their own at home. 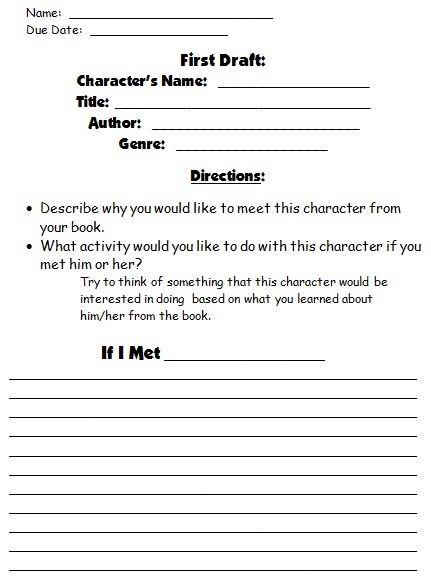 This main character body book report project has been one of my students' favorite projects of the entire school year. They have really enjoyed sharing their book report projects and discussing their main characters with their classmates when they have completed their projects. 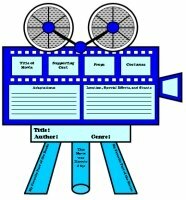 I hope that your students enjoy creating these unique main character projects too! 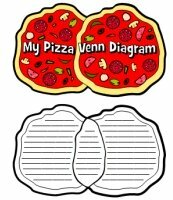 your students come up with for this fun book project! For these main character body book report projects, I encourage my students to think about what makes their characters unique, and to use these ideas in designing their characters. Above: This is an example of a book report project for the BFG from the book The BFG by Roald Dahl. 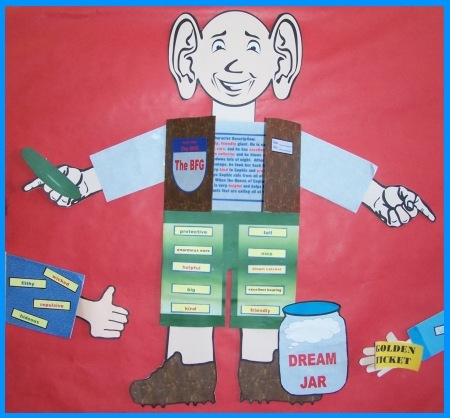 To make this character unique, the student designed the BFG has with large ears, holding a snozzcumber in his hand, and by his feet is his Dream Jar. Above: This is an example of a book report project for Mr. Twit from the book The Twits by Roald Dahl. 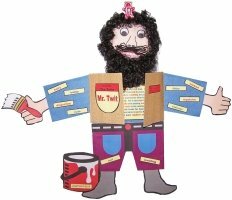 To make this character unique, one of my students designed his project to have a hairy beard, Mr. Twit holding a paint brush in his hand, and by his feet is his can of hug tight glue. 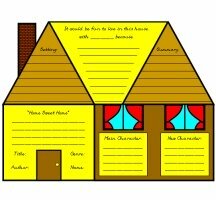 Above: This is an example of a book report project for Violet Beauregarde from the book Charlie and the Chocolate Factory by Roald Dahl. To make this character unique, Violet is chewing gum and she is holding a golden ticket in one hand and a stick of chewing gum in her other hand. Above: If the main character of the book is an animal, students can easily adapt this project into an animal shaped book report project. This is an example from Lisa's classroom, she teaches Grade 4 in Connecticut. 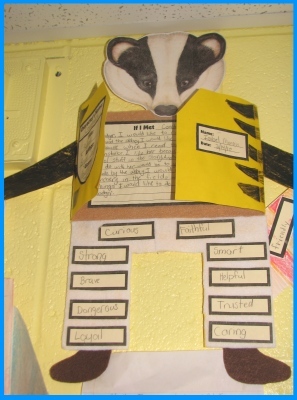 Her student's main character was a badger. Above: This is an another example from Lisa's 4th Grade classroom in Connecticut. 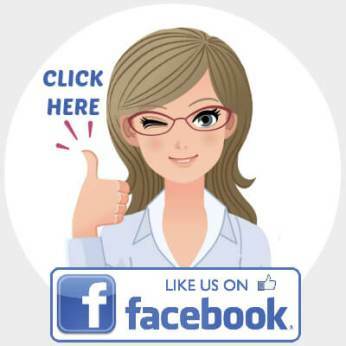 This character must be cool, as she's wearing sunglasses! 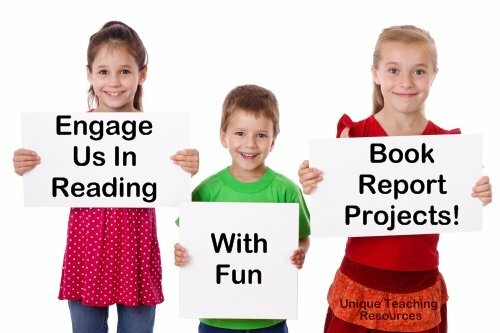 Click on the graphics below to view each book report project. Body Book Report Projects page. Click on the navigation bar above, or on the orange links below, to view the pages and resources on this website. 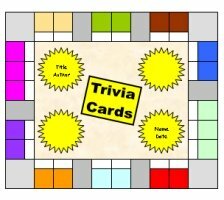 Book Report Projects - Make Reading Fun With These Unique Templates! 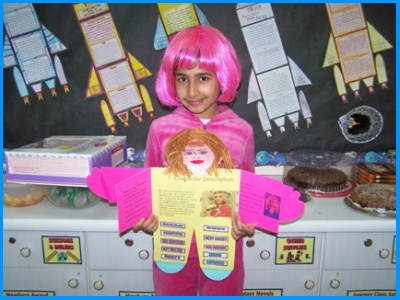 More Than 25 Creative Book Report Projects to Choose From! 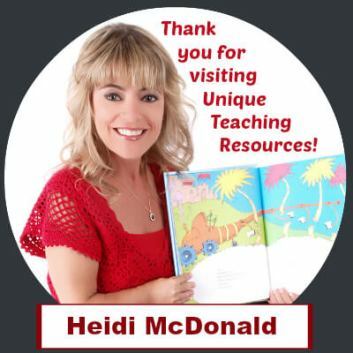 Please be sure to check out the other pages on Unique Teaching Resources for a large variety of fun lesson plans that will engage your students in learning and save you valuable time.